For me this symbolises what learning and working should be all about. When we are having fun we forget we are working, and suddenly what seemed a chore, becomes easier to complete and repeat without even noticing we are working! I was reminded of this by a friends post on her WordPress blog (see the video) which is also good fun & related to the topics that I have been musing over since the Olympics have finished…. 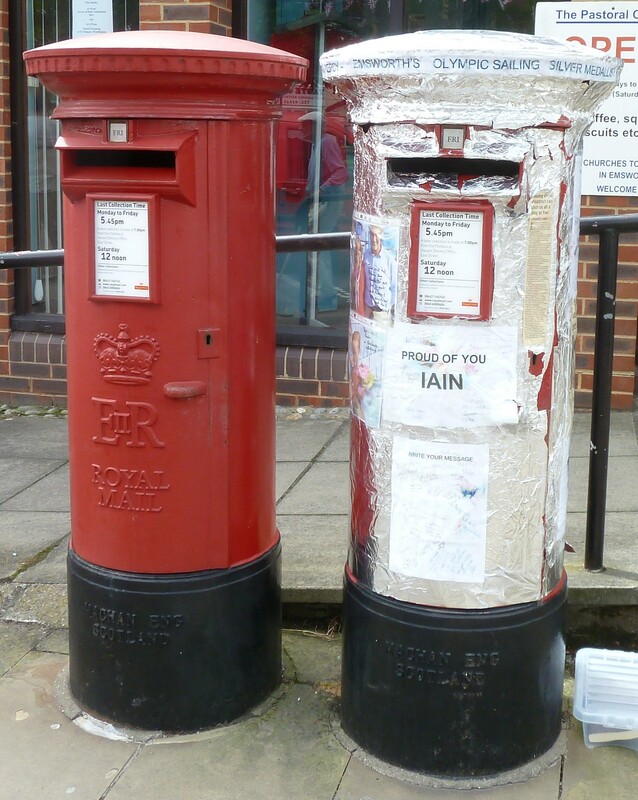 Emsworth residents are clearly proud of their medallist & it was hard to take photos because of the people crowding around the box to read the messages on it! I think that postboxes should have been painted Gold, Silver and Bronze, not just Gold! To win any Olympic medal ever is a major achievement!! At one time in my life I dreamed of making the qualifying time in the 200m, just to know that had the Olympics been held in Europe then (The next Olympics were in Seoul), I might have been allowed attend!! If you have a read of the news entries from Emsworth Online from August the 6th and August 8th, all becomes clear. This one is in Ewell Road, Cheam in honour of Joanna Rowsell who won her Gold medal cycling in the Women’s Team Pursuit. Here’s the official Photograph from the website & the ‘Team Stamp!’ As a former philatelist I think I must get myself one of her stamps to go with the photo! As for the inspired generation… judging by the age and shape of a lot of the joggers and cyclists on the roads since the Olympics, it definitely seems to be mine! I certainly spent time during the track and field events remembering how good it felt to be really fit and wondering if I had any more ‘comebacks’ left in me! (I have had 2 so far – my first at 21 when I stopped smoking for more than a year & achieved my fastest 200m time of 25.8s, and my second aged 31 when I stopped smoking for hopefully the last time made the transition to longer distance and actually managed to run 7 miles all at once on a regular basis!) Admittedly it took me 70 minutes, but for a sprinter to run cross country for more than an hour without stopping is nothing short of a miracle! PS: Request for help from experienced WordPress Bloggers… I would like to add groups of photos in a grid, or as a slide-show. I can see that this is possible but am confused how to do this? Any suggestions would be very gratefully accepted! This entry was posted in 40, Athletics, Getting old, Keeping Fit, Life, Olympics, Philately, Teaching and tagged 200m, 40+, All Ireland Gold Medal, Belgrave Harriers, Cheam, Cross Country Running, Emsworth, Gold Letter Boxes, Gold Pillar Boxes, Gold Post Boxes, Help!, Iain Percy, Inspire a Generation, Joanna Rowsell, Long Distance Running, Maths, Olympic Medals, Teaching, The Fun Theory, Track and Field. Bookmark the permalink. The photos question might be one to ask on twitter. Then when you get the answer, share it with me please! i couldn’t work out how to add the photos to the gallery without adding them to the blog first & then deleting them once the gallery was there! Seemed over complicated to me! Hi Barbara! Thanks for following my blog. Do you have an About page? I can’t see one. The first thing I do when I visit a new blog is check the About page. I had an idea when I came up with that post, but then different things have come into my head to blog about since then which all seem diametrically opposed to each other and not very linked in any way…. It’s sometimes hard to know where to start!! All great material! I suggest you write draft posts with the key points; they will refresh your memory when you come to write them properly. Your blog will evolve into something you probably never envisioned. Mine started life as a bit of everything and changed as I began to learn what I liked to write and what people liked to read. Don’t feel constrained to go one way over another – just write what you feel like writing; you’ll find your voice. I have been doing just that… I write emails to myself when I think of things to write about, or good headings…. I have a diary app on my beloved iPad which I use to compose posts late at night, when my spelling is far from accurate! I have had a go at an ‘About me’ piece which should now show in the sidebar…. This is a big learning curve for me! Thanks for the tip! Let me know what you think, or more importantly if you can’t find it!! Neat video. We have a thing here for people working in high rise buildings. “Up 1, down 2.” The idea is to encourage folks to use the stairs instead of elevator if they’re only going a short ways. I’m assuming they don’t count the ground floor as the first floor in the UK?